A few blogs helped me plan a winter tour in Somerset in the UK so hopefully this blog will give others tips! We arrived at Bristol Airport and drove straight to the American Museum in Claverton Manor House just four miles outside Bath. We did deliberate about this as we wondered whether it made sense to visit an American Museum whilst on a visit to the UK. Wow, we were glad we opted for it as it was a real treat. If you are a quilt enthusiast, a lover of old houses, somebody who loves amazing scenery and somebody with an interest in American history and culture, definitely pay this place a visit. The house is in a fabulous location with a breathtaking view over the Avon valley. The collections of furniture, quilts, silver, glass, portraits and exhibitions are all held within the manor house itself so you get to enjoy the displays as well as the fabulous home. There is an exhibition centre at the side of the house and at the time of our visit, there was a wonderful display of quilts in addition to the quilts exhibited in the house. There is also a wonderful cafe in the Orangery which had plenty of choice and not too expensive. 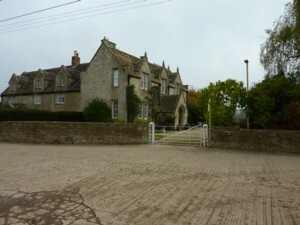 After this visit, we headed for our bed and breakfast a few miles further on just outside Corsham. Pickwick Lodge Farm is a 17th century Cotswold farmhouse situated within a 300 acre farm. We loved this place and it oozed English charm. Gill, our host, made us feel so welcome and was quick to give us tips as to where to eat. 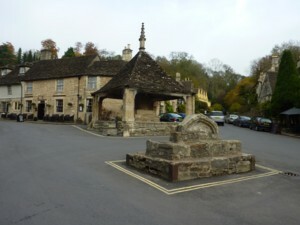 The following day we set off for Castle Combe village which is about 12 miles from Bath. This is one of the most picturesque villages in the Cotswolds with all the houses built out of the traditional cotswold stone so don’t miss it as it really is a gem! It has been the setting for a few films, eg Dr Doolittle. We stopped at the Allington Farm Shop near Chippenham on the way to stock up with supplies for our self catering accommodation. 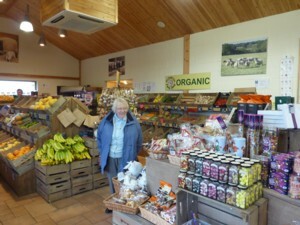 The shop supplies home and locally produced food and also has a lovely cafe and garden centre. I had to resist buying too much as it all looked so delicious!! After this we headed for Lacock which is another very pretty village totally unspoilt by any modernisation. 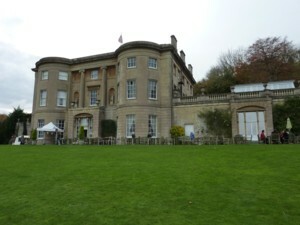 It is about 3 miles from Chippenham and is almost entirely owned by the National Trust. 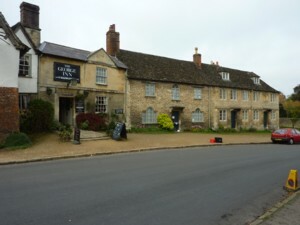 The village of Lacock is mentioned in the Domesday Book. We had a meal at the George Inn which was to be highly recommended. This village has been used in numerous television programmes and films. From Lacock we headed into Bath city centre to indulge ourselves at the Thermae Bath Spa which was a fabulous millenium project. We had been to this spa before and would never pass up on the opportunity for another visit. Where else are you going to be able to enjoy thermal springs in the centre of a wonderful city. You look at the building from the outside just minutes walk from the Roman Baths and you can’t even image what awaits you. The spa is amazing. I suggest you start off in the downstairs pool, the Minerva Bath. The thermal jets around the side of the bath are wonderful. Progress next to the open air roof top pool. You can literally swim around in the middle of winter and look over the city of Bath and the surrounding hills – the view is incredible. After this, head for the aroma steam rooms. Each of these rooms are infused with a different scent, eg eucalyptus, frankincense etc and in the middle of the room there is a massive waterfall shower that at least 10 people could stand under – It goes on and off on a timed basis. Lastly, you can always opt for a treatment (we didn’t) or while a way some time in their lovely cafe. I think this millenium project is out of this world and you will discover that many private spas are not nearly as amazing as this public one!! 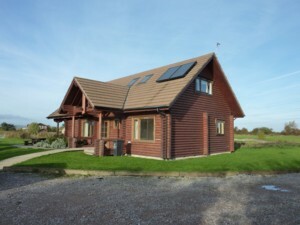 Our self catering accommodation was based at Lower Lakes Log Cabins in Chilton Trinity near Bridgwater. This place is a dream. Our open-plan log cabin, Meadowside Lodge, overlooked a lake (some of the occupants of other cabins went fishing). It’s such a peaceful place and is an excellent base for touring Somerset. Our log cabin was wonderfully airy and every detail was thought of. We stayed here in November and were really warm inside the cabin. It’s very spacious inside – a real treat. 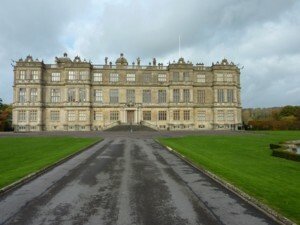 Our next day’s adventures took us to Longleat, near Warminster, one of the few stately homes open in winter. The sheer scale of this house and the 900 acre estate is breathtaking so take your time going around this place. 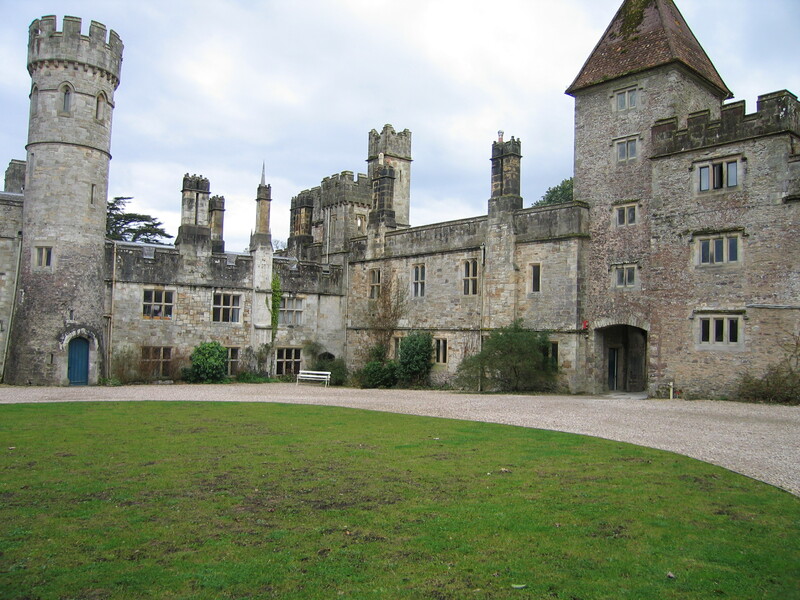 The house was finished as far back as 1580 and is now the home of the Marquis of Bath. It’s absolutely packed with antiques and portraits and you even get to see some of the artwork done by the Marquis himself. I think it tells us a bit of his character. We had a really informative guided tour of this vast place. Afterwards we had tea downstairs in the cellars which was also to be recommended. On our way back from Longleat, we stopped at Sheppys Cider Museum just outside Taunton but were a bit disappointed. 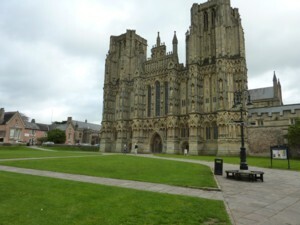 Our next day’s trip was to the city of Wells and then on to the Cheddar Gorge. Wells is mentioned in the Domesday Book. It is truly a medieval gem with a fascinating cathedral. We arrived on market day (Wednesday) so there was a real buzz of activity in the town centre. The cathedral itself is in the heart of the city. 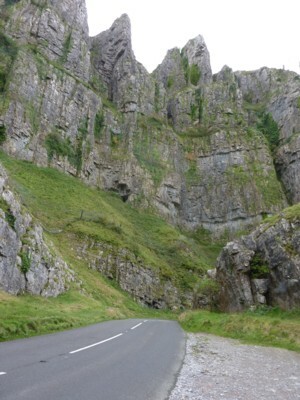 From Wells we headed up into the Cheddar Gorge which is a limestone gorge in the Mendip hills just outside the village of Cheddar. It is well worth a visit. We stopped in Cheddar village and did a tour of the cheese making facility. The village looks like it might be a bit trippery in season but in November, it was fine! The rock formations in the gorge incredible so allow time to get out of the car and explore. On the next day we headed to Minehead and Dunster and on to Porlock and through Exmoor. There were many stunning views from various points on our tour of this area. The Exmoor national park is spread over a wide area. 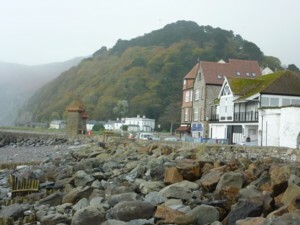 the largest towns being Porlock, Dulverton, Lynton and Lynmouth. You could easily spend days in this area particularly if you are a keen hiker. 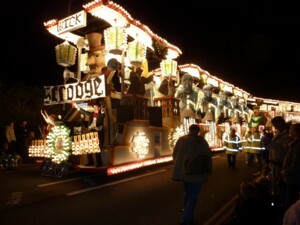 Another highlight of our visit to Somerset was the Bridgwater Guy Fawkes Carnival. This is a massive illuminated night time procession of road trains all laden down with beaming lights and all kinds of displays. We were amazed how easy it was to get in and out of Bridgwater to view the carnival. Definitely visit this if you happen to be in this part of the world for Guy Fawkes. Wrap up well as this procession lasts for a good while. I was amazed at how many road trains were involved. They just kept coming. On our last night we stayed at Pennard House Bed and Breakfast which is situated near Shepton Mallet. This is a lovely old house brimming with character. Our final stop before returning to Bristol Airport for a short plane trip back to Cork was to visit 1 Royal Crescent in Bath. The house is maintained by the Bath Preservation Society and is a wonderful example of a 1700s town house. 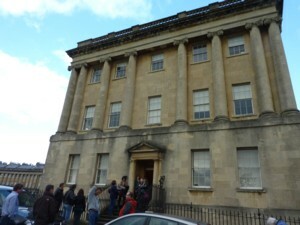 It was the first house to be built in the crescent and originally provided luxury accommodation for aristocrats who came to Bath in the old days to take the waters. Stroll through the sitting room, bedrooms, kitchen and get an idea of how the gentry in Bath really lived. We loved our short trip to Somerset and highly recommend this part of the world. There are many fascinating places in the area that were not open in winter so we’ll be back at some stage for a summer visit. This choir will perform in St Peter’s Church, Bandon at 8pm on Saturday, 15th May. Admission euro 10, children euro 5. All proceeds to the restoration of the organ at St Peters Church. The choir is comprised of 70 students from Kansas Wesleyan University and is directed by Ken Hakoda. There will be a guest soloist. This event is not to be missed!!! The annual West Cork Literary Festival will take place in Bantry from 4th to 10th July. Some of the well known names who will appear will include fay Weldon, Michael Palin, Margaret Drabble and John Boyne. The festival is supported by RTE Lyric fm and is organised by West Cork Music in partnership with the Cork County Library and is fund by the Arts Council and Failte Ireland. There will be master classes in travel writing and fiction, seminars on the art of editing and research methodology, workshops on various topics such as songwriting, writing for women, freelance journalism, poetry and many other events. The programme for the annual music festival in Timoleague has been published and includes some very interesting concerts all taking place in the Church of the Ascension in Timoleague. These concerts are always popular and are great value at euro 15 per ticket. 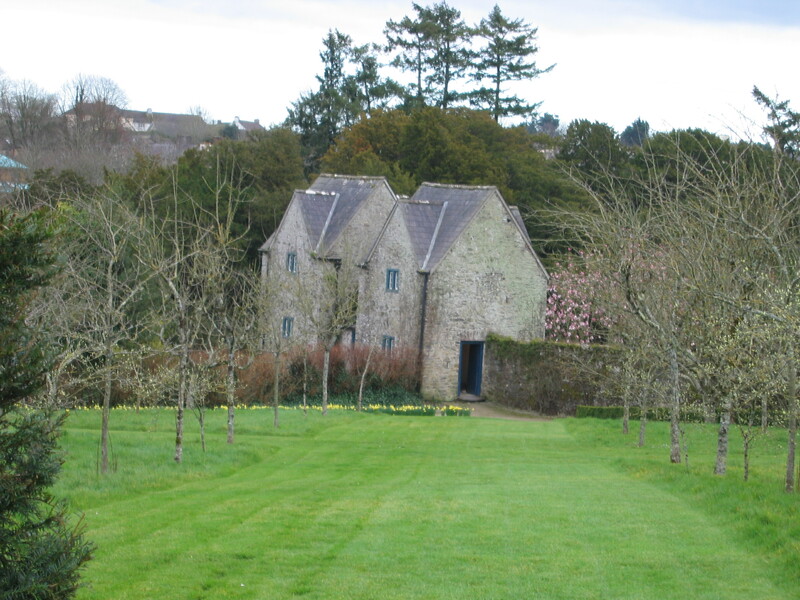 Also, remember that Timoleague Castle Gardens are open for ticket holders to picnic from 6pm on concert evenings. Sunday, 20th July at 8pm Jenny Robinson ensemble. Programme includes Telemann, Banch and other renaissance composers. Sunday, 27th July at 8pm Trioca. Programme includes Bax, Hamilton Harty, Telemann and Ravel. The launch of the Innishannon Flower Festival is this evening at 7pm. This is a joint venture between St Marys Roman Catholic Church and Christ Church Innishannon Church of Ireland and the funds will be split between their respective restoration projects. The cause is a worthy one and the entrance fee is only euro 10 which includes the admission to the festival in both churches and tea in the national school opposite St Marys Church. Many Flower Clubs are taking part in this festival and the churches look truly amazing inside. 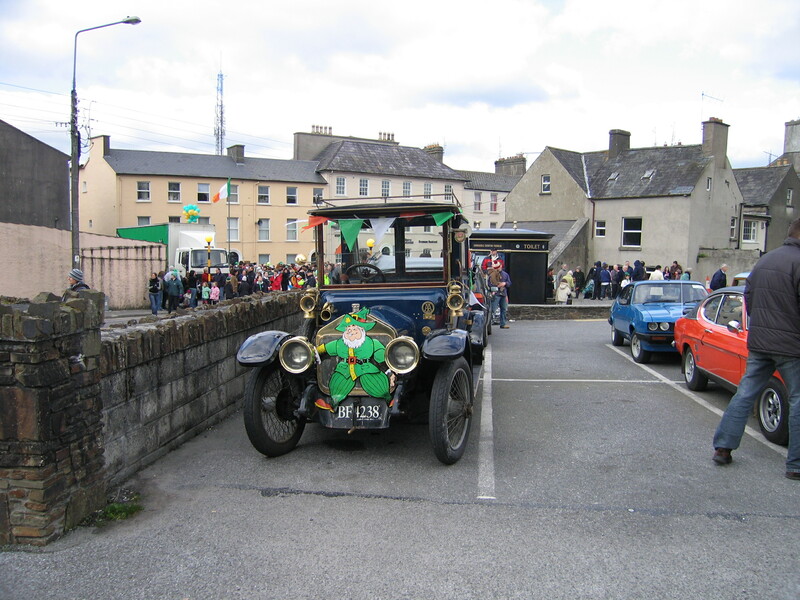 Take yourself down to Innishannon over the next few days. You can even buy some plants at the plant sale in the tent at the back of Christ Church. Kilbrogan House is part of West Cork Calling, a co-operative network of businesses spread across West Cork that offers a wide range of courses, activities and accommodation. The group has been set up by the members themselves who were part of a Mergo initiative put together by Failte Ireland, the Irish Tourist Board. The West Cork Calling network should enable the participants to market their products directly to the customer without sizeable individual advertising costs and/or costs associated with marketing via a third party. Many local networks exist within towns in the region. This group felt that a diverse network spread throughout the region would complement the local networks. The ultimate aim of the group is to get members to work together to offer packages. The network allows small and large businesses to participate together as the barrier to entry in terms of financial outlay is low and there is no exit barrier. All the participants strive to achieve a common goal of attracting tourist to the region and at the same time offering first class products. It is anticipated that the network will double in size over the next 12 months giving the customer an even wider choice of products and services. You are currently browsing the archives for the festival category.